Hibs head coach Neil Lennon expects any deal to sign Celtic midfielder Scott Allan in January ahead of his pre-contract move in the summer to be done at the end of the transfer window. 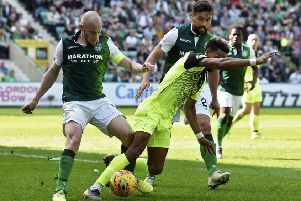 Allan agreed a three-year contract with Hibs last week which comes into effect at the beginning of the 2019/20 campaign, but Hibs are trying to strike a deal with Celtic to bring him in for the second half of this season. Lennon is also keen to add a striker to his squad and reiterated that Hibs “are still looking for that type of player”.